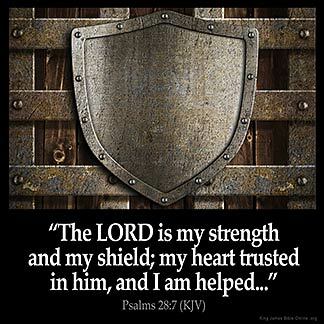 PSALMS 28:7 KJV "The LORD [is] my strength and my shield; my heart trusted in him, and I am helped: therefore my heart..."
4Give them according to their deeds, and according to the wickedness of their endeavours: give them after the work of their hands; render to them their desert. 5Because they regard not the works of the LORD, nor the operation of his hands, he shall destroy them, and not build them up. 6Blessed be the LORD, because he hath heard the voice of my supplications. 7The LORD is my strength and my shield; my heart trusted in him, and I am helped: therefore my heart greatly rejoiceth; and with my song will I praise him. 8The LORD is their strength, and he is the saving strength of his anointed. 9Save thy people, and bless thine inheritance: feed them also, and lift them up for ever. The Lord is my strength, and my shield, my heart trusted in him, and I am helped: therefore my heart greatly reioyceth, and with my song will I praise him. The Lord is my strength and my breastplate, my heart had faith in him and I am helped; for this cause my heart is full of rapture, and I will give him praise in my song. Jehovah is my strength and my shield; my heart confided in him, and I was helped: therefore my heart exulteth, and with my song will I praise him. The LORD is my strength, and my shield; my heart trusted in him, and I am helped: therefore my heart greatly rejoiceth; and with my song will I praise him. The LORD is my strength and my shield, in Him hath my heart trusted, and I am helped; therefore my heart greatly rejoiceth, and with my song will I praise Him. 28:7 I am helped - He speaks of it as past, because God assured him by his spirit, that he had heard and accepted his prayers. The joy of the Lord is my strength and his word is my shield : my heart trusts in Him and I am helped : therefore my heart is greatly rejoicing and with my song will I Praise Him. Glory to God for His wonderful Salvation !!!! This verse is a solid memory verse that has been tucked in my memory for life. It is a great verse to use during praise and worship. This verse is very uplifting and it showed a steadfast believe in our Lord Jesus Christ. This is such an uplifting verse, it has answered my prayers, for so long have I trusted the Lord to come through for me; I have doubted HIM, but now I know that HE is the promise keeper GOD.